I can't believe that my "baby" is already 8 years old! The years have just flown by, especially since he has 2 younger brothers. Alex is such a smart kid, no seriously, he has taken an IQ test and he is reallllly smart! He is always wanting to learn, and is very hands on! I am the exact same way! He enjoys Star Wars, Wii, playing with friends, legos, and sometimes reading! Alex was so suprised that we got him a BB gun for his birthday! He was very happy!!! 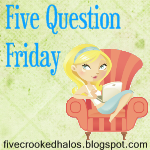 I love the whole idea of the 5 Question Friday. I think it is a neat way to get to know me, with all of the random questions! I hope that you enjoy reading them! If you are a fellow blogger, jump in and join in!!! Anything terrible happening to my family! As a mother, I try and protect them from everything bad. I try and keep them healthy, happy, educated, in good shape, and so on, but somethings are just out of our hands. I pray that my family remains happy and healthy! I use a flat iron! Up until last May when I had the horrifying incident with highlighting my own hair, I didn't use anything! But now since I am maintaining this short hair style, I have to use a flat iron or my hair is a fluffy mess!! Phone to the ear, I cannot talk on speaker phone or not have control of the phone, makes me crazy!! We do!! We bought it when I was pregnant with Mason! Love it! No, all of the new ghost hunter shows on TV these days drive me nuts!! !